I wonder if, before he was born, Peter Molyneux's mother promised that her son would one day be honored with a Lifetime Achievement Award at the Game Developers Conference. If so, in contrast to Molyneux's games sometimes not delivering on promised features, her pledge will now come true. At the 2011 Game Developers Choice Awards ceremony that will take place in San Francisco this March during GDC, Molyneux will be praised by his peers for his career developing games that spans over 25 years. Molyneux is most commonly held to be the grandfather of the so-called "God game." 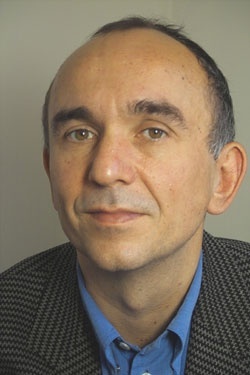 Beginning by creating a text-based business sim for the Commodore 64, Molyneux eventually founded Bullfrog Productions where he made the games Populous and Dungeon Keeper. He later founded Lionhead Studios, which made Black & White in 2001 before eventually being acquired by Microsoft in 2006. As both a major producer on the Fable series and the Creative Director of Microsoft Game Studios in Europe, Molyneux's influence on the game industry is far-reaching. On top of that, he definitely knows how to bro-hug. "Peter is a remarkable asset to the games industry, and truly embodies everything that the Lifetime Achievement Award represents," said Meggan Scavio, event director of GDC. "We're proud to honor someone who has had such a profound impact on the industry, through his boundless enthusiasm and profound talent in creating games about choice and interactivity that the entire world loves to play." 2011's honoring of Molyneux will mark the 11th Lifetime Achievement Award presented at the GDC. Previous recipients of the award include Shigeru Miyamoto, Sid Meier, Richard Garriott and Will Wright. Tim Schafer, currently of Double Fine Productions (Pyschonauts, Brutal Legend) and previously of LucasArts (Grim Fandango, Secret of Monkey Island, will return to hosting the awards show as he did in 2009 and 2007. With both the very charismatic Molyneux and Schafer on stage, the show will no doubt be pretty funny. And, as Schafer pointed out in a recent Tweet, "I wonder if this means I will finally meet Peter Molyneux? (I'd better go finish Fable III)"